“This album started as a collection of songs and tunes about gold. But as we searched, like the alchemists of old, it turned into a wider idea. In the process we saw the greed, disasters and victories inherent in the search and exploitation of various sources of wealth in this world. Then, as if by demonic serendipity, along comes the worldwide economic crisis. We watched the major banks, insurance companies and Hedge Funds etc. implode, discrediting the entire financial system and many of its managers and advisers - But there was still more to come. We, in Britain, could only stand and watch aghast as many (too many) Members of Parliament, and the House of Lords at Westminster, ‘the Mother of Parliaments’ were exposed for their cynical misuse of the expenses system, often amounting to fraud. With this new album, Battlefield Band offers us songs both old and newly composed. Alongside new songs like ‘Robber Barons’ are tracks such as Nina Simone’s ‘Plain Gold Ring’. As always with Battlefield Band, they produce Contemporary Scottish music - 2000 years in the making. "...a wondrous, perfectly paced display by musicians firmly in command of their art...a Highland jam that rang the rafters." Under their banner Forward With Scotland’s Past, Battlefield Band have been distilling their own unique form of the Scottish spirit and exporting it worldwide, with concerts in China, Malaysia, Germany, Hong Kong, Australia, New Zealand, Italy, Austria, Switzerland, Holland, Syria, Jordan, India, Sri Lanka, Egypt, U.S.A., Canada, Uzbekistan and the U.K. Inspired by their rich heritage of Celtic music and fired by the strength and vibrancy of today's Scottish cultural scene, which indeed they have done much to create and fuel, they have led, and been at the forefront, of a great revival in Scottish music. 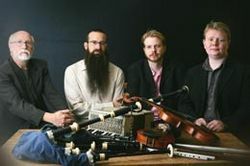 Refusing to be limited musically by suffocating antiquarianism, or the music business' fashions, they have mixed the old songs and music with a new self-penned repertoire, all played on a fusion of ancient and modern instruments - bagpipes, fiddle, synthesiser, guitar, flutes, bodhran and accordion.